After terrorising so many defenders on the pitch with his skills, Barcelona legend Ronaldinho couldn’t help himself when the opportunity arose with Carles Puyol. The pair were attending a charity event with the club and they found themselves standing beside each other, as seen in the video below. While Puyol seemingly appears to lean over to speak to his former teammate about something, Ronaldinho is too busy plotting what’s about to happen as he nonchalantly rolls the ball between Puyol’s legs. It takes the former defensive stalwart a second to realise what he’s done, and the reaction is priceless. 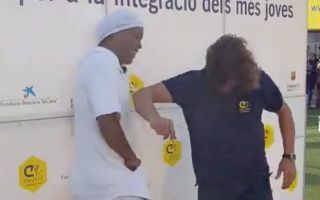 Naturally, Ronaldinho can’t hold back the laughter, but he gets a little nudge from Puyol who didn’t seem particularly impressed.